Hirshel great post. I am one of those litvkas who watch the kinnus every year and I love watching the achdus at the kinnus. But this writer hit the nail on the head and I would love to see the other reactions. We all have Nissim that we experience on a personal level in our life. Some on a smaller level and some on a larger level. But a nes such as the release of SMR is something that Klal Yisroel has not exprienced in decades. Now you are correct that it was 11 months ago and at the point all of klal Yisroel celebrated in the streets of NY. But let’s look at chabad as a chaisdus. The shliucim conference is the time of the year when all get together which TBH I don’t know of another sect that has such a beautiful event. Wouldn’t you think that as a chasidus we should all thank Hkb”H for the nes he did for a member of our chasidus ? Yes they sang ani mamin at the morning photo shoot for the victims of Pittsburgh but they can’t sing Ani mamin when Hkb”h did a nes nigla for their own chaver ? What would have the rebba done ?? From my little knowledge of the rebbba he would have called SMR up and sand Dida Netzach for an hour straight. Which leads me to think why was he maligned ? Is he not good for their PR ? For their fundraising ? To honor god forbid a convict ? While I see what the complaint is, we can't ignore that there was a huge amount of publicized celebration in all of Lubavitch upon his release. Certainly to the point where no one can claim Lubavitch swept it under the rug. Why not at this specific event? Who knows? Maybe there were other things that needed highlighted and there's only so much time? Maybe they asked him and he felt it didn't need highlighting? Why automatically assume it's part of some international conspiracy? Here in Pittsburgh there are more pressing things to think about like the fact that the recovery effort by the chevra kadisha is still ongoing. So from our end we were much more excited to see the ani maamin by the Pittsburgh shluchim and maybe we're missing the obvious horrible anti SMR campaign going on. Reb Sholom Mordechai was celebrated and welcomed, he was in fact the first person interviewed and we all cheered him on. The format of the Kinus is extremely unique and is unlike many other Chesed Dinner where there are many speeches. The Kinus Hashluchim sticks to a theme and drives home that message in various ways. Hirshel, please focus on the positive instead of inviting people to share their negative thoughts about this holy assembly. This is not a convention of Chabad chasidim, or chasidus. it is a kinus hashluchim. And only that. 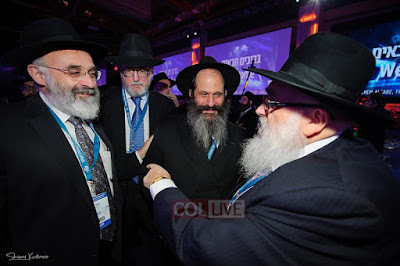 To the extent that Rabbonim who are lubavitchers, but are not shluchim are not invited. Rabbi Groner who the rebbe zy"A's gabbai was never part of the kinus. Etc. The SMR issue is a tremendous simcha, but has nothing to do with the work of Chabad and it's shluchim. The shout-out that he got in the beginning was more than enough recognition. ( Perhaps even too much, as his attorney went on a trump diatribe, whereas Chabad is careful to always remain apolitical, especially in a tumultuous political arena as we r in 2018) Even that was not necessarily necessary. As per Rabbi Balkany ( brother in law of SMR )other communities, such as Satmar and Lakewood (yes, Lakewood) were much more involved in the Rubashkin saga than Lubavitch .He said this on the Zev brenner show on the Motza"sh after the release.1 Go figure.
" But let’s look at chabad as a chaisdus. The shliucim conference is the time of the year when all get together which TBH I don’t know of another sect that has such a beautiful event. Wouldn’t you think that as a chasidus we should all thank Hkb”H for the nes he did for a member of our chasidus ?" Not the lower caste and normal anash. SMR was there is an anomaly. I was not there and I thought he was just like me. "How could Chabad not give public thanks for the נס גלוי that happened to one of their own"
Atleast as much thanks as that was given to the נס גלוי by the Entebbe Airport..
"I see no reason to rehash the Vechter/Entebbe/Boycott saga here. It doesn't belong."